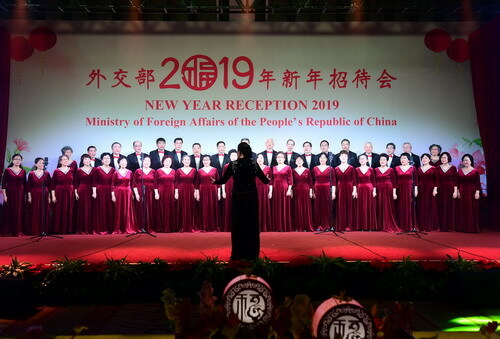 On January 31, 2019, State Councilor and Foreign Minister Wang Yi held the 2019 New Year Reception for diplomatic envoys from various countries and representatives of international organizations in China at the Diaoyutai State Guesthouse. 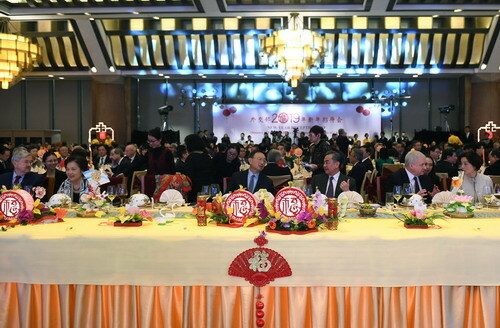 About 400 people attended the reception, including Member of the Political Bureau of the Central Committee of the Communist Party of China (CPC) and Director of the Office of the Foreign Affairs Commission of the CPC Central Committee Yang Jiechi, heads of relevant departments and Chinese and foreign guests. 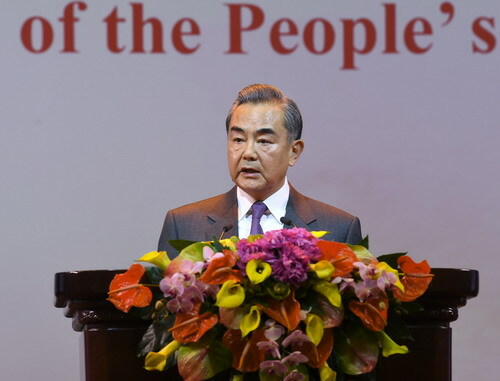 Wang Yi expressed in his speech that the past year saw continued profound shifts in the international landscape, and a further build-up of factors of instability and uncertainty. Amid a complicated international situation and great changes unseen in a century, we forged ahead under the strong leadership of the CPC Central Committee with Comrade Xi Jinping at its core, and made new strides in China's foreign relations with a clear sense of purpose. We established Xi Jinping Thought on Diplomacy as the fundamental guideline for conducting China's foreign affairs in the new era. We advocated the vision of a community with a shared future for mankind and, keeping in mind the common interests of all countries, provided Chinese perspectives and proposals on navigating the once-in-a-century changes in our world. China has become an important force for stability, a strong advocate for openness, an important driver of cooperation, an important promoter of peace, an important upholder of the international order and an important engine of development. China has a more distinct and prominent role to play. 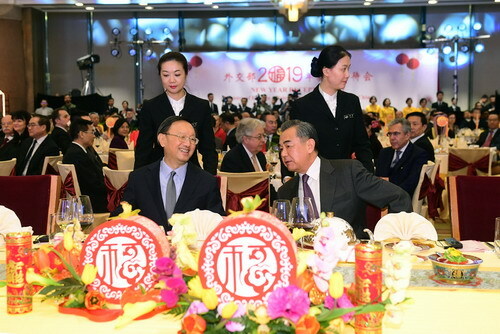 Wang Yi said that 2019 marks the 70th anniversary of the founding of the People's Republic of China. Over the past seven decades, especially since the 18th CPC National Congress, China has broken new ground on the diplomatic front and the Chinese nation has made substantial contributions to global peace, prosperity and progress. We will make a comprehensive review of this great journey and carry forward the fine traditions of China's diplomacy. We will put into action Xi Jinping Thought on Diplomacy in every aspect of our work. We will remain true to our mission and make unremitting efforts to open up new prospects for our major-country diplomacy with distinctive Chinese features. 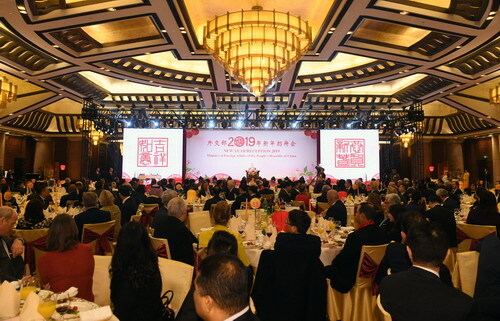 We will continue to follow peaceful development, advance cooperation for win-win results, safeguard the international order underpinned by multilateralism, build partnerships, play a mediating role in regional hotspots, serve China's reform and development, and defend China's legitimate rights and interests. China looks forward to working with all other countries, come rain or shine, to embrace a brighter future for all of us. Head of the delegation of diplomatic envoys in China and Cambodian Ambassador to China Khek Cai Mealy Sysoda, on behalf of diplomatic corps of various countries, wished the Chinese people a happy new year. She expressed that China has scored remarkable and tremendous development achievements in the past four decades of reform and opening up. China has showcased its responsibility as a major country in international and regional affairs and played an important role in safeguarding world peace and promoting common development. It is hoped that China will carry out more intensified mutually beneficial cooperation with various countries in the new year to jointly make greater contributions to world prosperity and stability. 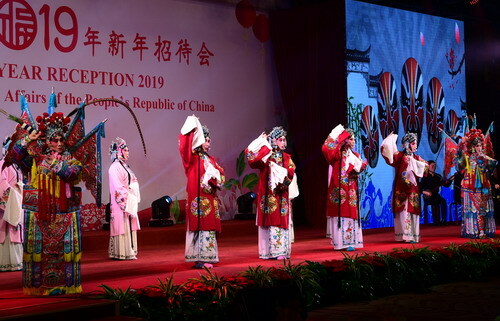 At the reception, the chorus of old cadres of the Foreign Ministry, young diplomats and staff of the Cambodian Embassy in China jointly gave Chinese and foreign guests an excellent performance, wining rounds of applause.